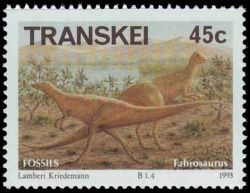 Transkei 1993 "Fossils: 3rd set of the series"
Fossil bones of extinct reptiles that inhabited southern Africa around 200 million years ago are found in the Karoo rocks of Transkei. 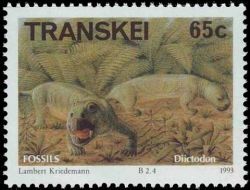 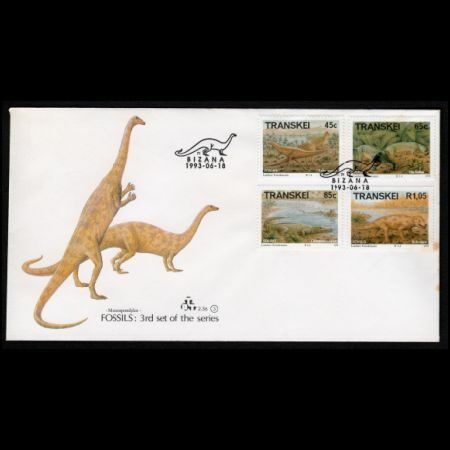 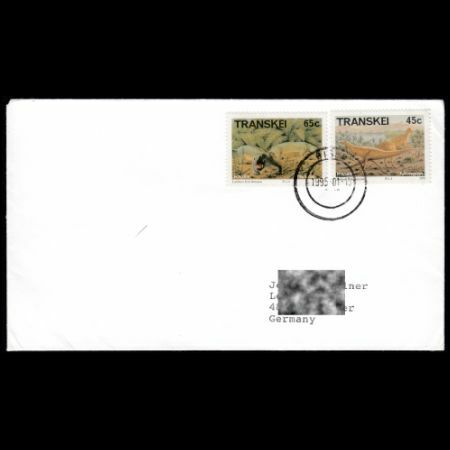 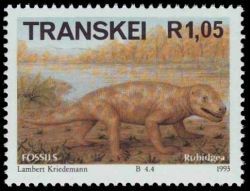 This set of stamps shows reconstructions of four of these prehistoric vertebrates in their natural habitats, based on the available fossil evidence. 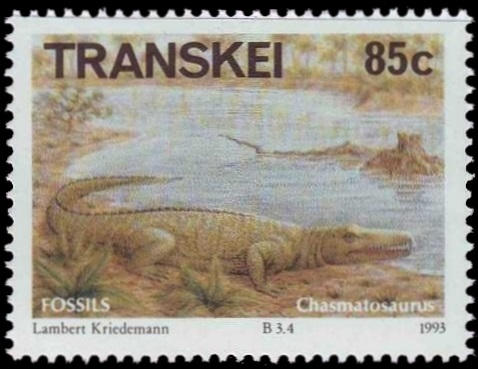 The Karoo rocks comprise cemented sand and mud originally laid down by large meandering rivers that flooded their banks and in the process buried numerous skeletons of ancient reptiles that lived and died on the flood plains, including dinosaurs. 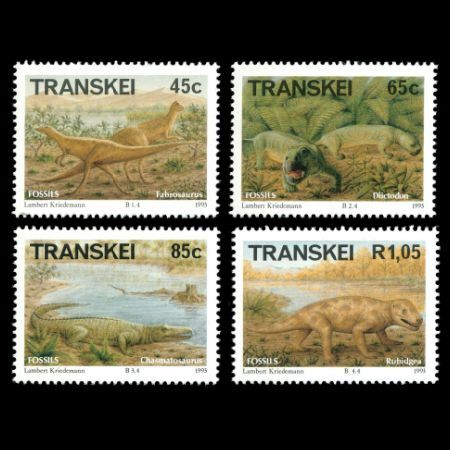 At that time, southern Africa was part of an enormous continent called Gondwana, which later drifted apart to form the current continents of the southern hemisphere. 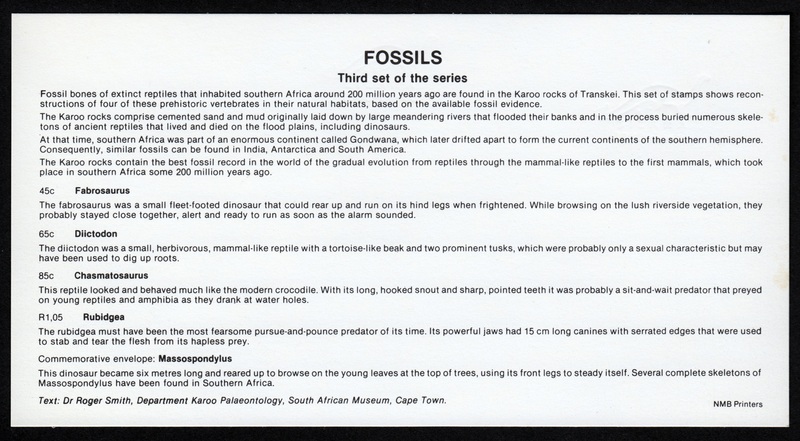 Consequently, similar fossils can be found in India, Antarctica and South America. 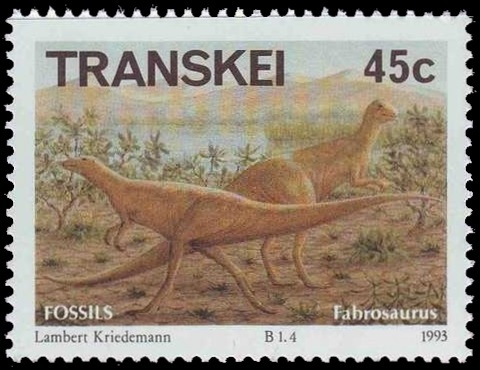 The Karoo rocks contain the best fossil record in the world of the gradual evolution from reptiles through the mammal-like reptiles to the first mammals, which took place in southern Africa some 200 million years ago. 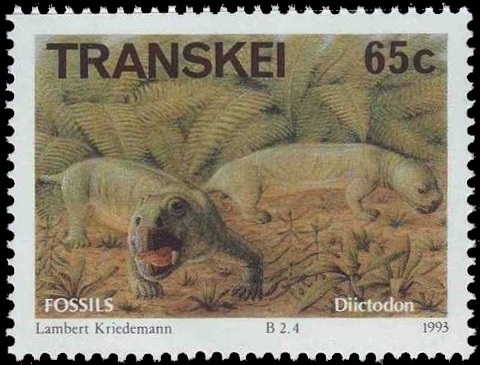 The diictodon was a small, herbivorous, mammal-like reptile with a tortoise-like beak and two prominent tusks, which were probably only a sexual characteristic but may have been used to dig up roots. 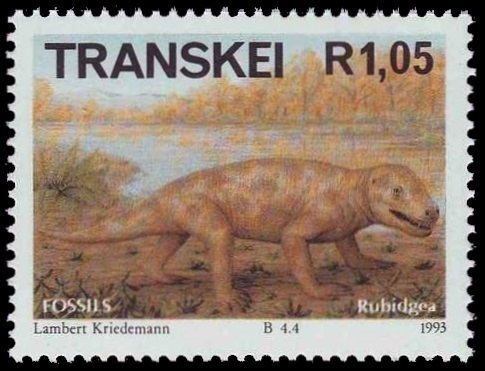 The rubidgea must have been the most fearsome pursue-and-pounce predator of its time. 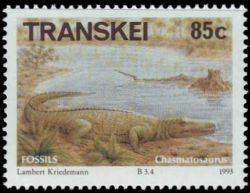 its powerful jaws had 15 cm long canines with serrated edges that were used to stab and tear the flesh from its hapless prey.